Art trends are so interesting and along with the Adult Coloring Book Craze This Doodle idea has also become ridiculously popular but what do they all mean. It sort of sounds like a new language and it kinda is. 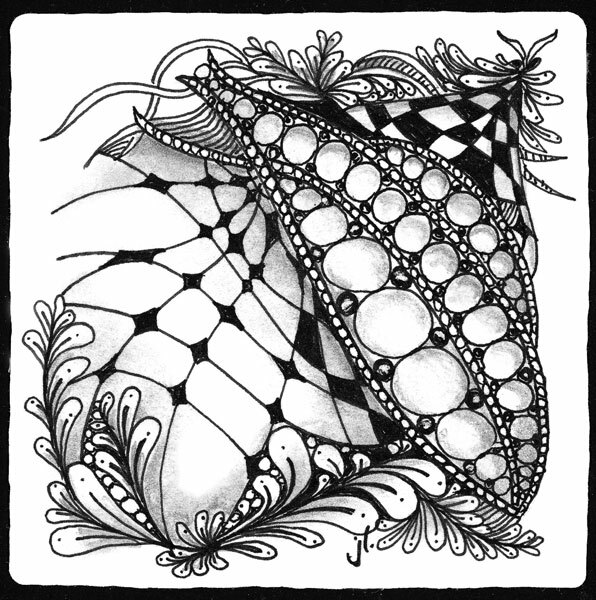 Zentangle is an official trademarked name for specific “Tangles” that the creators and official CZT’s (Certified Zentangle Teachers) have created. You will see the name of the CZT or Rick Roberts and Maria Thomas the couple who are the creators of this new art trend. I really am attracted to these very detailed and organized designs but the whole idea behind Zentangle is the “ZEN” part of it.. to be able to relax and create something quickly and inexpensively that turns into a piece of art. What I don’t like about it is all the RULES that seem to follow this trendy hobby. You are almost mandated that you really aren’t doing REAL Zentangle until you take a class from a CZT. You have to use a micron pen from Sakura, and you MUST purchase the official Zentangle tiles. The Zentangle “Kit” is $49 and contains 34 3.5 x 3.5 tiles, 2 Sakura pens, 2 pencils and a sharpener, a DVD and a card with several tiny patterns on it. You can buy just the official Zentangle tiles but those are .52 each plus shipping. That is pretty pricy since all you really need is a writing utensil and any blank piece of paper. Suggesting all these rules to be an official Zentangle rubs me the wrong way. There are several private groups on Facebook and many of them are delightful with lots of ideas and encouraging members to do their own thing and create, but others demand you only use official tangles on the 3.5 x 3.5 cards to be able to post there and no questions are to be asked or answered about the art. There is also a do not erase rule, a only black and white rule and you can only use official Zentangle patterns. Zentangle terminology is also very important to the strict CZT’s so you don’t call it doodling if you are using Zentangle Patterns, that’s Tangling. If you are using any thing other than the official tile s and black pen and shading with a pencil then what you are creating is call Zentangle Inspired Art (ZIA) Rules are not where I find MY Zen. My suggestion is to hit Youtube for FREE and learn from the wonderful and talented CZT’s and non-CZT’s that are sharing how to do tangles. Ellen Wolten’s Video’s are really great and easy to follow. Here is Heartrope which I was having a hard time figuring out. And there are a few on the Official Zentangle YouTube Channel here. Maria teaches Betweed which is one of my very favorite tangle patterns. Maria is an excellent instructor on these videos but there are only these 3 “OFFICIAL” ones. The TanglePatterns.com page is a must visit as it has over 500 tangles with links to the “Step-Outs” for each Zentangle. A Step Out includes the step by step method to create the complex looking pattern. It’s comprehensive and very organized. Make sure you have an hour or two to browse. Linda Farmer, CZT has spent many hours linking up all this information. For Paper its perfectly fine to use any paper you have on hand. If you want to get a similar feel to the official paper then chose a watercolor paper. If you want to tangle on the 3.5 x 3.5 cards simply cut them yourself for a much more economical way to tangle on tiles. Personally I decided to tangle in a mixed media journaling type of art paper book. They even come in tan or grey paper or even black paper where you use white or gel pens to tangle with (again this is a no no to official Zentanglers but it’s really gorgeous! Check out my latest Zentangle Pinterest Board. Follow Chrissy Morin’s board Zentangle in Color on Pinterest. Your options for ways to color your Zentangles and Doodles is pretty much unlimited.. The difference in price an quality will show up with whether or not the markers smear easily and how bright and vibrant the colors all. Again the Sakura Gelly Roll pens have been favorites for years and years.. not just since doodling and Zentangles arrived on the scene. Sakura 6-Piece Gelly Roll Assorted Colors Stardust Meteor Pen Set This Gelly roll stardust meteor set is gorgeous! Colors included are: silver, marine, copper, pink, green and blue. Sakura 10-Piece Gelly Roll Metallic Gel Ink Pen Set – LOVE love these pens It’s really hard for me to decide if I like the glitter pens (aka Stardust) or these metallic ones best. Metallic colors include: silver, copper, blue, red, green, purple, pink, emerald and 2 golds. Koi Watercolors – I just bought this set so I haven’t gotten to play with it yet but I loved that it comes with a medium water brush. Just that brush costs $8 so I thought this was a great value and I can’t wait to play. Sakura 24-Piece Koi Assorted Water Colors Field Sketch Set with Brush – This Koi kit is a Portable field sketch kit for use on the go or at home and it includes brush, sponge, built-in palette, 24 mini watercolor cakes, plastic case with a refillable koi water brush to transport and store water. I prefer working in an Art Journal so I can see my progress and refer to step-outs I’ve done of some of my favorite Tangles. This one is my favorite and I save it for when I really want to get my Zen on I love the Strathmore Visual Journal. It is Spiral Bound 5.5 x 8 and it’s a Mixed Media Vellum paper. With this smaller size I can tuck it into my bag, take along a couple pens and be able to Doodle anywhere. I checked out every Zentangle book my library had available and also purchased a couple. TOTALLY TANGLED Zentangle & Beyond – This book isn’t for the newest beginner. First I would visit lots of the Zentangle Video instructions I listed above for free, buy some pens and paper and play for awhile. but Sandy’s books take you to a new place with LOADS of ideas to take your tangles off of those tiny cards and onto things like her bathroom floor and cute dolls. She’s a mixed media artist so for her the mixing of tangles and art and fun drawings is much more in line with my idea of ART and ZEN. High on the list would be the “One Zentangle a Day: A 6 Week Course in Creative Drawing” by Beckah Krahula CLICK HERE TO BUY. Beckah give you lots of background about Zentangle and art in general and then has step outs for 2-4 tangles a day and then practice ideas after you learn the tangles of the day. JOY OF ZENTANGLE – as a newbie to Zentangling I really enjoyed this book. There are a ton of tangles to learn with great step outs for them. This book was the one that started to irritate me with all of the rules and talk about copyrights of the tangles etc. but I enjoyed the instruction and just ignored the ads that declared you HAD to buy the kit and take a class to REALLY Zentangle.. Ridiculous! The Mendala Zentangle Pack – $15.07 ($19.99 on Zentangle.com) Sometimes called Zendala’s this is Zentangle done on a circular tile.